We all know the benefits of a great blog. A perfect blog will help to build your brand’s reputation by grabbing readers’ attention and showcasing your site as a credible source of information. If you have it automated with your e-newsletter, a blog is also a great way to keep your brand top of mind with subscribers. But beyond these media benefits of a blog, it can also be a powerful inbound marketing tool. Time and again, content marketing has proven to be massively effective in driving customer engagement and lead generation. Quality articles with optimized metrics for ranking, delivered on a consistent basis, will build up your domain authority and web traffic over time. We compiled a year’s worth of content marketing data from our clients’ projects and analyzed it against several keyword research tools and content optimization tools. We then had that data analysis reviewed by a statistician who holds a Master of Science in Statistics from Texas A&M University. 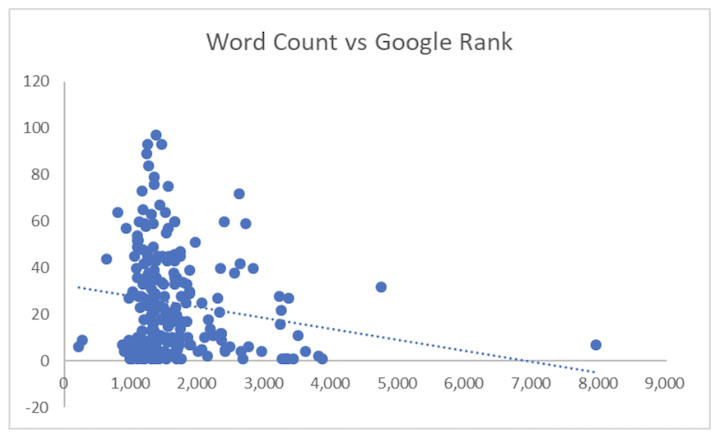 The results show which tools are most effective in determining the probability of ranking, and what measures you can take to improve the quality of your content. The following are four of the most important things to keep in mind when you’re launching a competitive content marketing strategy. Yes, I’m sure you already knew that keywords matter. But it can’t be said enough: Find keywords that suit your niche and are competitive enough to rank. SEMRush is a brilliant platform for digging into your site’s statistics (i.e., organic traffic, ranking keywords, backlinks, etc.) and investigating competition. Check out a competitor’s site with similar traffic to your site to see what keywords they’re ranking for. 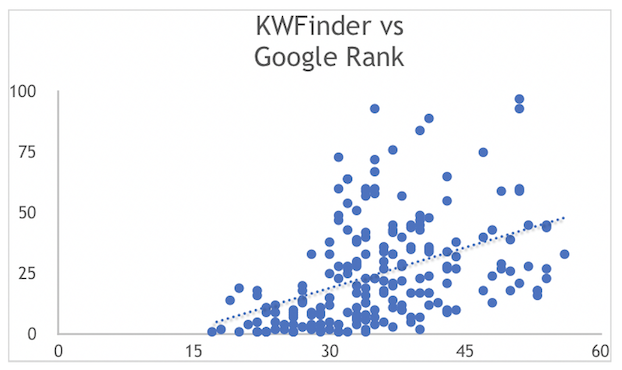 Next, take some of those keywords and plug them into a keyword research tool (like SECockpit by Swiss Marketing Apps or KWFinder by Mangools) to check the competition score and monthly search volume. This will not only give you an idea of the metrics you should be aligning with your own site but may even give you some specific keywords to steal and target right off the bat. There are three things you always want to keep in mind when performing your keyword research. Two of them were already mentioned. You want to find the right balance of (1) monthly search volume, (2) competition score, and (3) competitors’ domain authority. With these generalized metrics, you should be able to find some great keywords to target. Remember to always use that target keyword near the beginning of your article title. For example, if your keyword is “hot cocoa recipes,” the title could be “10 Hot Cocoa Recipes to Impress Your Date This Winter” as opposed to “Impress Your Date This Winter with These 10 Hot Cocoa Recipes.” Also, aim for titles with less than 60 characters. There’s no getting around it: Hire quality writers. Ask for their portfolio, give them a test assignment, and take the time to read through their material. Building a strong relationship with an awesome writing team makes a world of difference. Think about it: You want articles that people will actually stop and read (and, ideally, share on social media). Plus, Google scans for readability. Grammar, spelling, and flow are very important. A great way to test your writers’ abilities is to ask them to use HemingwayApp. This (free!) platform demands simple, easy to read sentences. The focus is on clarity. Aim for a Grade 9 or less. If it’s in your budget, it definitely doesn’t hurt to have an editor review and fix up your content as well. Word count matters too. We’ve found that articles should be at least 1000 words each. First—and this might seem obvious—1000 words provides a more in-depth look at a certain subject. Google sees that and decides that it’s a more valuable article than, say, a 500-word piece. Second, you’ll be able to keep readers on your site for a longer period of time. Try breaking up the article into sections with headings, subheadings, and lists where applicable. Great stock photography and customized infographics will help you present your content in a palatable format. GIFs and YouTube embeds can be good too, but be careful because these can potentially slow down the loading speed of your site on readers’ devices. No one wants keyword stuffing. It reads terribly, it makes your brand and website look awful, and Google is too smart for it. 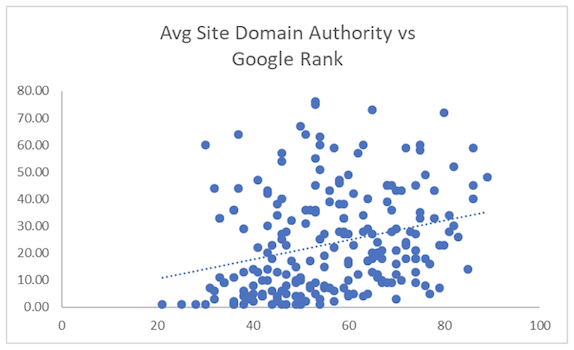 If your article reads like gibberish because you’re trying to shove in a bunch of keywords, then you’re not helping your chances of ranking and building up your domain authority. Instead, try a content optimization tool like CognitiveSEO or MarketMuse. CognitiveSEO is fantastic for making this step super easy. You put your target keyword and title in, then drag and drop the entire article. 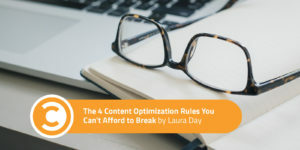 It will break the keyword optimization into three parts: (1) Keywords you already use, (2) keywords you should use, and (3) keywords you should use more often. It is a useful tool for working through the article and naturally integrating more keywords. It will even show you a “keyword stuffing” score, so if you’re getting a bit too ambitious, you can rein it in. Boost that content performance score to increase your probability of ranking. MarketMuse works similarly, and we’ve found both tools to be very beneficial for optimizing content rankings. 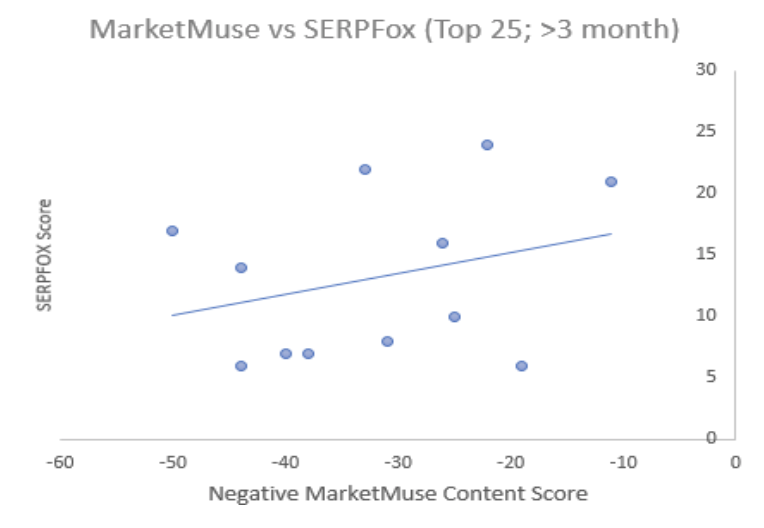 Note: In the MarketMuse vs. SERPFox graph, Negative MarketMuse Score was used instead of MarketMuse Score because of the ascending nature of MarketMuse Score (higher is better) versus the descending mature of SERPFox Ranking (lower is better). Use alt tags for all images (I generally go with the target keyword or a secondary keyword). Make sure the article is broken up into easy to read sections with headings and subheadings. Add keyword tags to make the article searchable on your site. Add an SEO title and meta description to the back end to cater to Google’s spiders. It’s always a good idea to save your article to draft mode and have someone else look over it before publishing. More often than not, you’ll find a few last-minute changes to make. With these data-determined metrics and the best tools available, your articles will have a much higher chance of ranking in Google. The more quality content you have on your blog, the better, so get to it! With two or three posts per week using these techniques, you’ll start to see your traffic and domain authority growing at an exponential rate within the coming year. Laura Day is a Project Manager for Content Refined, a content marketing company based in Ontario.